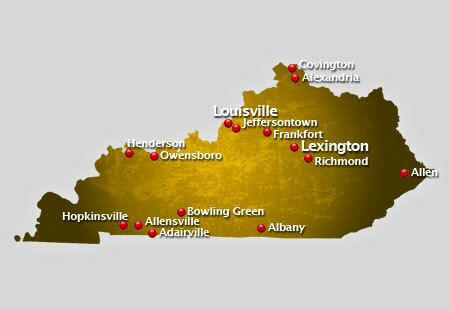 AirSign provides extensive aerial advertising coverage throughout all areas of Kentucky. From beach aerial advertising to sporting events and over busy highways, we'll display your message to crowds in a way your audience will be certain to remember. Considered as one of the states with more than four state borders, Kentucky is bordered by seven states. These state borders are Ohio, Ilinois, Indiana, West Virginia, Tennessee, Missouri and Virginia. The state is also known as -Bluegrass State- since bluegrass is found all over the state. It is rich in natural resources including the world longest cave system, the Mammoth Cave National Park and some great livestock including thoroughbred horses and large free-ranging elks. Such natural gifts were contributed by a good climate. The state has a humid subtropical climate, with hot humid summer, cool winters and substantial amount of rainfall all throughout the year. Of the eight public four-year universities of the state, two top universities in Kentucky are the University of Kentucky and University of Louisville. These two universities are major research universities and the remaining 6 universities are the regional universities. The flagship university is the University of Kentucky and it handles the medical outreach programs in the east of the state. The University of Louisville, on the other hand, manages the medical outreach programs of the western part of the state. There are about sixteen public universities offering two-year courses. From these state colleges arise college athletics forming different minor and major sports league teams. Some of these league teams are Lexington Horsemen making its way to the major league of the Arena Football League, the Reds of the Major League Baseball and college division Kentucky Wildcats of the Division I Football Bowl Subdivision. Crowds are an aerial advertiser's paradise! A typical flight over popular events or locations can result in as many as 8,000,000 impressions! Have us fly your aerial banner over the crowds in Kentucky to put your message wherever you want, whenever you wish at the best value in mass marketing!